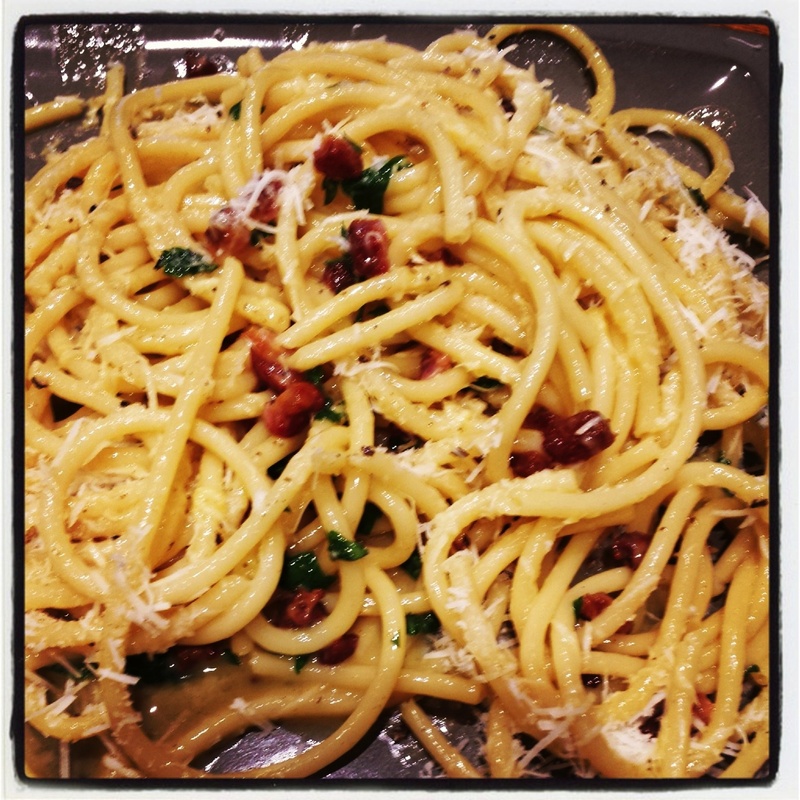 Gino’s Bucatini alla Carbonara took me back to Italy and is one of the best Italian pastas I have ever had. Simple to make with a handful of ingredients – my favourite kind of recipe. Add bucatini to a pot of boiling water with salt and cook for 7-8 minutes. Cook the pancetta in olive oil and butter until it is crisp and set aside. You could also dry fry the pancetta to save some calories but obviously the olive oil and butter will make it taste better! In a separate bowl, whisk the eggs & half the grated cheese. Add the chopped parsley and lots of black pepper. Add the cooked bucatini to the pancetta and stir. Making sure the pan is off the heat, add the egg/cheese/parsley mixture to the pasta. Stir quickly for a few seconds so that the egg doesn’t become scramble. The heat in the pasta will ‘cook’ the egg resulting in a silky, yellow ‘sauce’! Serve immediately with the rest of the pecorino cheese sprinkled on top and more black pepper. Gino D’Acampo’s book, Gino’s Italian Escape features a selection of recipes from Italy that will ‘help you eat like you are in Italy’! Definitely on my list! Gino’s Italian Escape airs on ITV every Friday at 8pm until 18th October. I will definitely be tuning in to the next one, waiting to be inspired!